When we went to bed Sunday night, there was heavy thunderstorm; rain didn’t stop until Monday afternoon. Now forecasters are telling about another round of thunderstorms possible on Tuesday morning. As result there was no school for daughter and office for hubby. Since they are at home I decide to make this chipotle olive oil crackers and roasted red pepper humus. Only work is to make chipotle olive oil crackers; the roasted red pepper hummus is very easy, just mix everything in blender or food processor. Hummus is a Levantine and Egyptian food dip or spread made from cooked, mashed chickpeas or other beans, blended with tahini, olive oil, lemon juice, salt and garlic. Today, it is popular throughout the Middle East (including Turkey), North Africa (including Morocco), and in Middle Eastern cuisine around the globe. The earliest record of dish similar to hummus was from Cairo in the 13th century. However the recipe uses vinegar and no lemon or garlic. Syrian Medieval cookbook Kitāb al-Wusla ilā l-habīb (also 13th century) has pureed chickpeas and lemons. Thus earlier version of hummus didn’t use any tahini. Modern day hummus is called Hummus bi tahini and comes from 18th century Damascus, in what is now Syria. Why hummus became important food in arid, rugged climates may be because it has enough protein and fiber to keep our bodies healthy for long periods of time. Also, this relatively simple food is amazingly rich in minerals and vitamins. Traditionally, hummus is served on a large plate, usually drizzled with olive oil and herbs and accompanied by fresh pita, tomato, onion, cucumber salad and maybe some falafel. Hummus is not only for pita bread, you can try it smeared onto sandwich, baked on fish, or made into a flavorful dip to enjoy vegetables, chips or pretzels. You can substitute this as a dip or spread just about anywhere. Remember, it even goes well with meat. 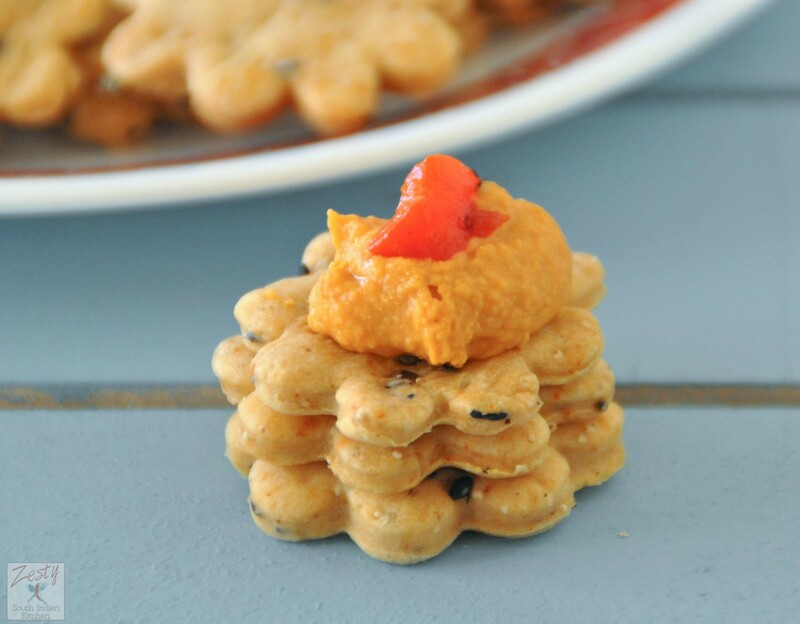 That is why I made these Chipotle olive oil crackers to go with red pepper hummus. I usually make humus at home from scratch using canned chickpeas, garlic cloves, lemon juice and salt along with olive oil. When you get a chance to make hummus without any hassle how can you say no. Yes Bush beans are introducing a new product called is humus made easy , what you need is that just buy that and mix it with BUSH’S ® Garbanzo beans/ chick peas, if you are going for traditional hummus; or with roasted red pepper hummus. If you want to make spicy black bean hummus then just add bush’s cooked black beans and then jalapeno pepper. You will be able to get it in your local Wal-Mart. Next time when you shop for canned beans, just grab this hummus made easy of your favorite flavors, you can make tasty hummus at home. Even my kids approved it. I think homemade crackers are best because of lack of preservatives and also know what is going into it. I used simple olive oil cracker recipe from Ottolenghi’s cook book and made it slightly exotic by adding, spicy chipotle pepper, black sesame seeds, poppy seed and toasted hemp seeds. This is very delicious, and hard to stop with one cracker. I made it spicy; if you can’t handle the spice, reduce the amount of chipotle pepper. Make sure to make dough 1 hour ahead of baking and refrigerate to develop gluten. Then cut it into your favorite shape and bake it. Crispy spicy cracker is ready. Once you done baking with crackers go ahead and make the red pepper hummus. I didn’t add any extra oil; if you want you can do that. I think they are so delicious you don’t need any add on. 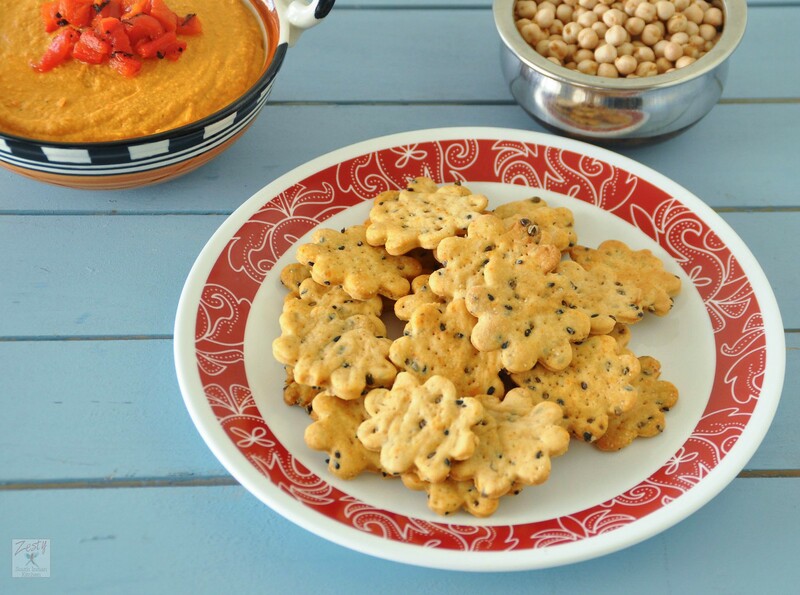 Trust me marriage between spicy crackers and sweet red pepper humus is a match made in heaven. Give it a try you will love it. 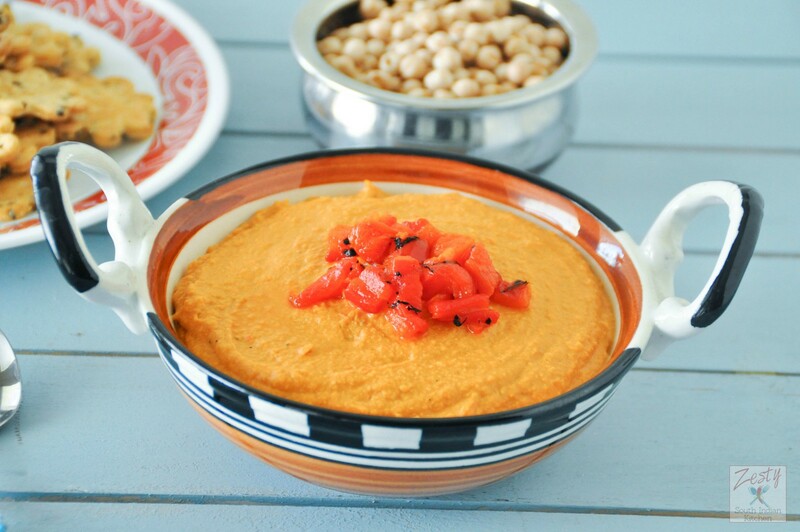 Here comes the recipe for both spicy crackers and red pepper hummus. If you make hummus using Bushs Hummus Made Easy products, please tag in Pinterest, Instagram with this tag “Show us your hummus” or tag me. 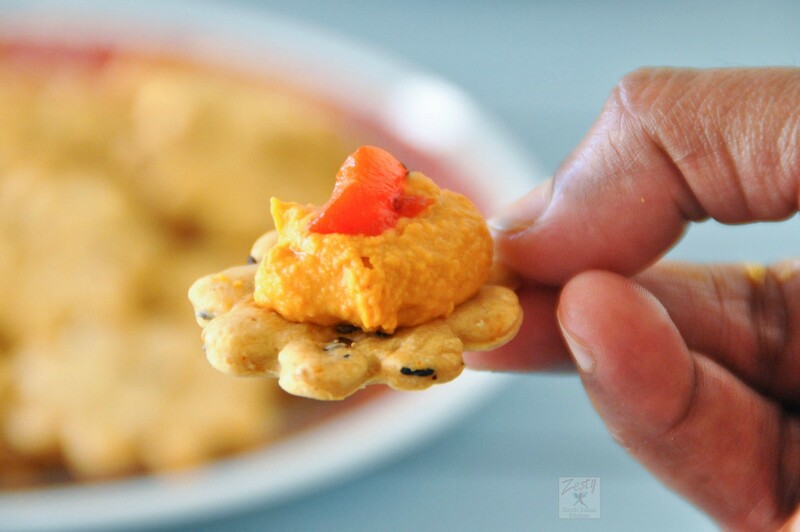 Delicious spicy chipotle olive oil crackers with red pepper hummus. A perfect appetizer which is match made heaven. chipotle pepper, black pepper, black sesame seeds, poppy seeds and hemp seeds. and water and form to a smooth dough. Spread the dough into 1/4 inch thickness sheet. Cut it into favorite shape I used 2 inch flower cutter to make flowers.make sure to poke with fork before you bake the crackers . This will prevent puffing up in the oven. And place it in cookie sheet slight brushed with olive oil. Bake the crackers for about 7 minutes or until it becomes golden brown color. Enjoy as much you want. 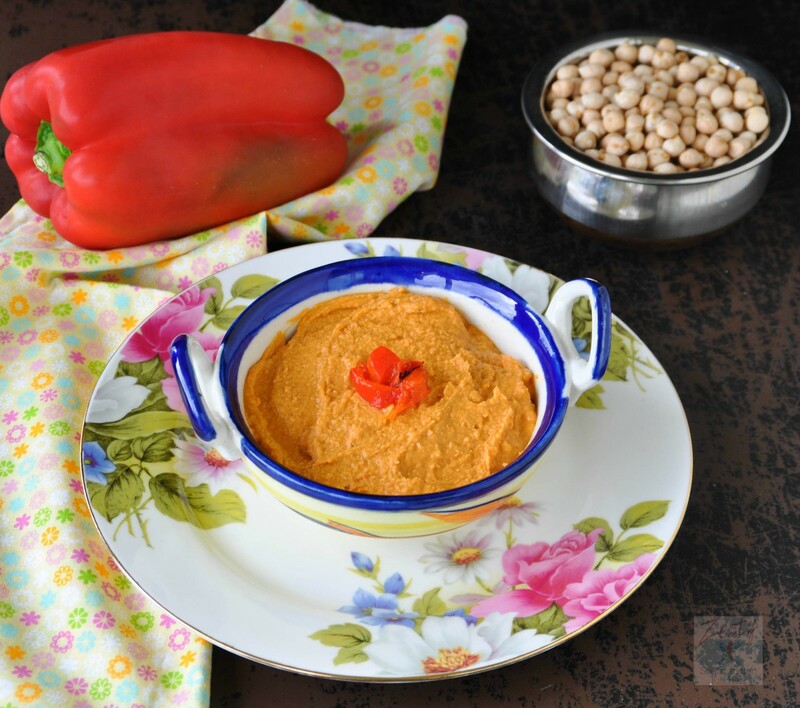 Add contents of BUSH’s Roasted red pepper hummus made easy pouch and 1 tablespoon of roasted red bell peppers and blend desired consistency. While serving top with some roasted red bell peppers. Boy does that look delicious! The photos are gorgeous and I can’t wait to try this recipe! This combination is awesome Swathi!!!! I could eat that whole batch of crackers, but certainly wouldn’t want to miss out on the hummus. Great snack. Hope you’re staying high and dry down there. Can’ believe the amount of water! Thanks MJ , Yes too much water, it is almost close to traffic lights in certain underpass. Heavy rain throughout sunday night and till afternoon monday. Our area is not flooded. That’s a very tasty combination.. I love how crisp those crackers look..just so wonderfully inviting! Interesting recipes..lovely combination..looks delicious swathi .. I am impressed with your cracker making! That is awesome, I would never think to make my own crackers! I guess since the hummus is so easy to make we can spend out time creating something else! 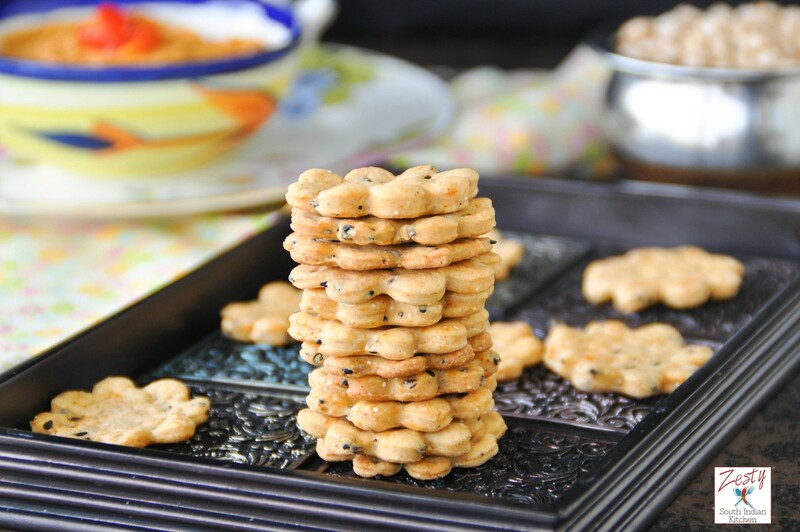 This looks so good and the crackers are easy to make. I look forward to trying both very soon. Your homemade crackers look so delicious and perfect with Bush’s #HummusMadeEasy. Beautiful job with your step by step pictures too. 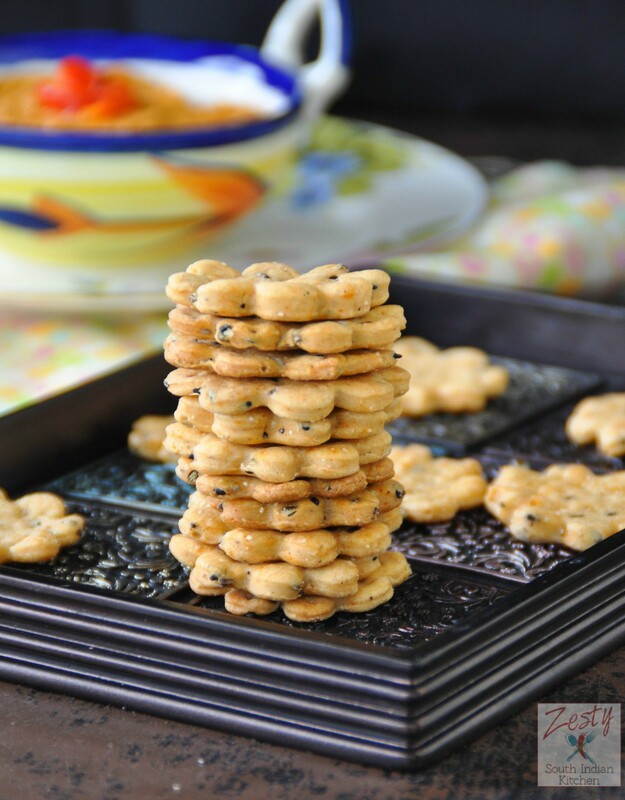 loved the Shape of the cookies…interesting step by step recipe..
Yummy! The crackers look amazing! The hummus is so easy! Beautifully made savory crackers, love the flower shape. 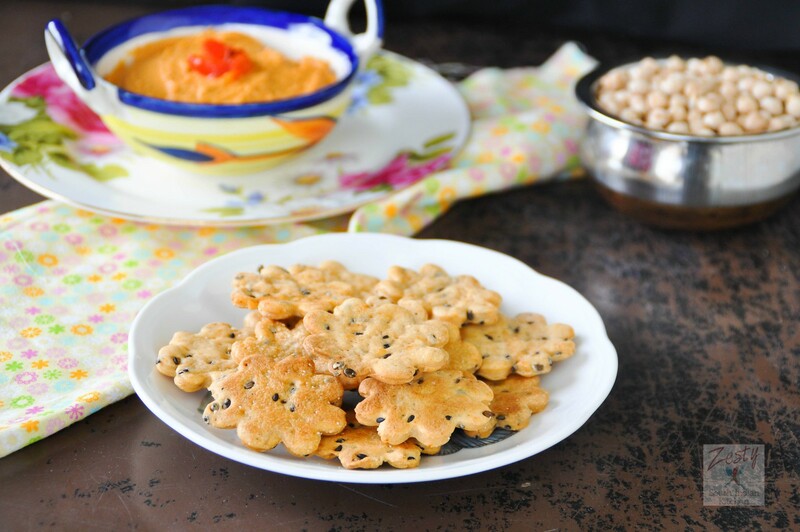 Delicious combination, crackers with hummus! Swathi, your gorgeous seeded crackers look like something I’m going to have to make next time I’m asked to take an hors d’oeuvre somewhere. So much better than any you can buy. I’ve never tried making crackers, but yours look delicious! I do like the idea of making my own and will have to give it a try soon. I bet they taste amazing with the hummus! Yes Julie these so addictive. I love it.